This is my character sheet, or design specification, for Elijah, probably the most famous Old Testament prophet. 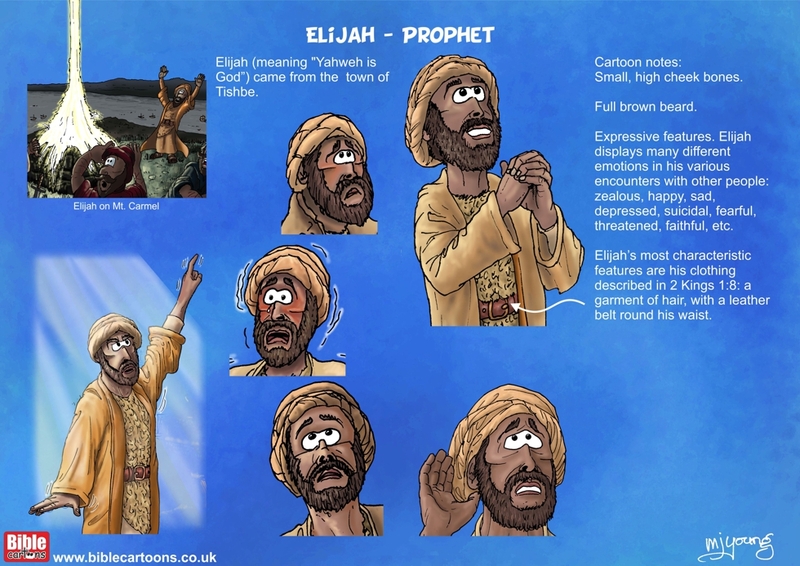 The purpose of this sheet is to keep a record of the attributes or characteristics of my drawing, so that I can draw a similar-looking cartoon in all future scenes showing Elijah. I have included a brief personal history on the sheet as well. I first drew my version of Elijah in August 2009, with the “1 Kings 18 – Elijah on Mount Carmel – Scene 07 – Heavenly fire” picture. Although my style has changed a bit since those early cartoons, I try to maintain the same facial features, colouring and clothing style, so that the figure is recognizably that of Elijah, even when months or years have elapsed between drawings. Elijah (meaning “Yahweh is God”) came from the town of Tishbe. He suddenly arrived before king Ahab in 1 Kings 17:1 (9th Century B.C. ), delivering a message from the Lord. As a result the land was in drought for several years. After delivering the message to the king, Elijah retired to a hiding-place by the Kerith (Cherith) Ravine, east of the Jordan, where he was fed by ravens. As the drought worsened, the brook dried up and God sent Elijah to the widow of Zarephath, a city of Sidon, from whose scarce food supplies he was miraculously supported for two years. During this time at Zarephath, the widow’s son died, and was restored to life by Elijah (1 Kings 17). Then occurs the famous confrontation with the priests of Baal and the miracle of heavenly fire on Mt. Carmel (1 Kings 18). The drought ends shortly after this confrontation, and Elijah runs to Mt. Horeb after Ahab’s wife Jezebel threatens his life. Mighty miraculous displays of power by God at Horeb follow, before Elijah invests Elisha as his replacement (1 Kings 19). Elijah was spared death and taken into heaven on a chariot of fire (2 Kings 2:1-12).